Author: Anthony E. Wolf Ph.D.
Beleaguered parents will breath sighs of relief and gratitude over this bestselling guide to raising teenagersIn this revised edition, Dr. Anthony E. Wolf tackles the changes in recent years with the same wit and compassion as the original edition. Dr. Wolf points out that while the basic issues of adolescence and the relationships between parents and their children remain much the same, today's teenagers navigate a faster, less clearly anchored world. Wolf's revisions include a new chapter on the Internet, a significantly modified section on drugs and drinking, and an added piece on gay teenagers. 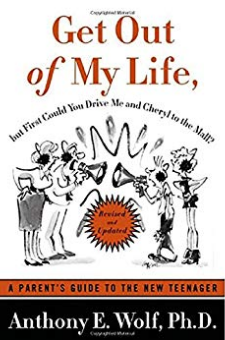 Although the rocky and ever-changing terrain of contemporary adolescence may bewilder parents, Get Out of My Life gives them a great road map.